It’s a bright sunny day and you are all ready to go for your much-awaited job interview. You have an interview, but for slight span and now you are waiting for a call to the next interview stage. Because according to you, you were splendid during the interview, answered all questions flawlessly and even created a good impression on the interviewer. But is that so! There are full chances that thoughts in your mind may be wrong! You might have answered all general knowledge questions correctly, but wait this is not concerned with your job post! Then why did the interviewer asked you such questions? Even your interview duration was very short as compared to other candidates. And here comes the result – “you are rejected”. The article below informs you about all possible signs interview went bad. You must be wondering that what went wrong, but the fact is clear! The interview itself is enough to understand that whether there are any chances of your selection or not. There are certain sure signs that indicate that your interview is not going well. So, if you want to know about all such signs so that you do not get disappointed next time then here it is. If your interview’s duration is very short then this is an ideal sign for a bad interview. A good interview lasts for long time period, at least for half an hour. This is because there are lots of things to discuss, lots of questions to ask, numbers of job responsibilities to explain and other vital points to discuss. So, if you are not discussed on enough topics and asked to move out of the interview room in very less time then there are more chances of your rejection. 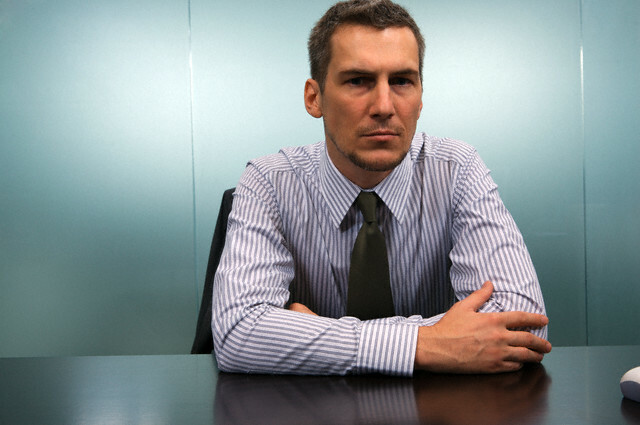 Body language of the interviewer is a strong indication to whether he likes you or not. If the interviewer is leaning toward you or nodding his head to answers you are giving then this is a positive sign for the interview. But if the case is totally reversed, and the interviewer’s body language is completely opposite to it then it clearly shows that he does not like you or finds you unsuitable for the job post. An interviewer who is genuinely interested in hiring you will focus on each and every aspect of yours. He will focus on your answers, skills, gestures and will make sure to have an uninterrupted conversation with you about the company and your job profile responsibilities. But if the interviewer is frequently moving in and out of the room, attending even unimportant phone calls, and asks you to repeat an answer again and again, then surely he is not interested in hiring you. A distracted and disinterested interviewer is again a sign for a bad interview. An eye contact is essential to have firm and clear discussions during an interview. This also shows that the person conversing with you is listening to all your answers, interested in answering your queries and understands all that you want to highlight for the concerned job profile. An interrupted, improper or rare eye contact means that the person opposite to you is not getting satisfied by stuff that you are saying. May be he is not liking your answer or didn’t like your body language or any other reasons, the result for all is same, he is not at all interested in hiring you. He is just waiting for some time to finish or might be thinking of an appropriate way to end the interview session. If the interviewer is not engaging in your conversation, then surely he must be thinking of something else. In such a situation, he may either not properly be following your answers or he may take lot of time to think for the next question to be asked. If he really wants to hire you, then he must have prepared a set of questions to be asked at the time of interview. In case, he is not sticking to his path anymore, chances are that he just want to wind up the interview and say you goodbye. If your interview is not going well, then the interviewer might ask you some silly questions like general knowledge or something else. This is just waste of time and he is only passing time with you without actually thinking of hiring you. If there are no questions asked regarding your skills, potentials or no details are provided to you regarding job profile then all this symbolizes a bad interview session. Asking silly questions during the interview period is simply wasting of time. Contradiction for every second answer given by you implies that the interview either think that you are dumb, or he is just trying to bully you in a positive sense. If he is happy with your answer then he will surely appreciate you rather contradicting. A frequent contradiction to your sayings can be accepted as another sign of a bad interview. This is an extremely vital aspect for any job interview. Whenever you are going for a job interview then surely, the interviewer will be interested in knowing your working skills and potentials. He may want to know that whether you are flexible with time, whether you can handle stress easily, whether you can even work on Sunday in case required, and more such questions. In case, he does not ask you about any such thing and even is not interested in knowing your work-related strengths and weaknesses, then surely he will not hire you at any case. If the interviewer thinks that you are appropriate for the job then he will discuss only you and not about other candidates who have applied for the same post. If you are the best, then there is no need to discuss other better options! But, if the case is not so and the interviewer discusses your other candidates that he is finding much suitable for the job, then chances of your hiring are greatly reduced. If he is finding others better than you, then simply, why will he hire you? If the interviewer is considering you as an appropriate candidate for the job opening, then definitely he would like to brief you about working for the company. He may want to give you details about what your responsibilities will be if you are hired. This is because discussing all such aspects during time of interview will clear him out, that whether you will be able to handle the work given to you and whether you will be able to deliver productive returns to the company or not. There might be more other factors that he may be testing while detailing you about your work responsibilities. In case he does not converse on any such thing, then this points towards a bad interview. If this is your first round of your interview session and immediately you are asked to wait for a phone call to next round then this is clearly a symbol that you are not selected. In case you have cleared two to three rounds but failed to impress the interviewer in last round, then he may ask you to wait for the call from company, or ask you to wait for a couple of days for next interview schedule. This is because most of the times no interviewer will like to extend an interview session to day’s time. Rather a good interview and selection are winded up on the same day or the next day, not more than this. You have sent your resume prior to the company, and you have been shortlisted for the interview based on your resume. But at the time of interview session, the interviewer either asks for your resume again or read your resume a couple of times despite asking any questions about it. This clearly indicates that he is not focusing on your work details and even not interested in understanding what all you have done. Your resume is just a piece of paper, which is of no interest to him and neither you. Whenever the interviewer is impressed by you or appreciates your accomplishments then he will surely smile at you or pass a friendly glance to you. The smiling, warm face of the interviewer indicates that he is impressed with you and wants you to become part of his company. Unfriendliness, snide facial behaviors express that you will not get the job and your interviewing is moving towards a unfruitful direction. If you impress the interviewer then he would like to know more and more about you. He would like to take maximum possible advantage of the available time and find out every necessary detail about you. But despite of doing all this, if the interviewer is constantly looking at his notes, or doing a file work during interviewing session then this is a bad sign to your interview. Your interview must be as important for the interviewer as it is for you. There are possibilities that the interviewer needs to cut the interview duration due to an unexpected emergency work. There is also a chance that he is suddenly not feeling well or there is a personal emergency due to which he needs to go. In all such cases, he might leave you unattended or may leave the ongoing interview in between. But before doing that, he will surely apologize as he wants you to come back or if he is interested in hiring you. In case, he leaves the interview in between or in few minutes without even apologizing for it then this shows that you will not be hired for the job. During the time of interview, it is not only the interviewer who asks all the questions. Even you have full right to ask any question related to your work, job profile or about the company. If you are asked to do so but there is no positive response coming from the interviewer’s side then your interviewing session is completely banged. Unresponsive answers from the interviewer indicate towards bad interview session and your chances of hiring for the job getting low. An interested interviewer will always like to know how you can benefit the company and also, how the company can advantage you. He will not only discuss present situation, but also what the company and he wants from you in coming future years. He will also inform you about benefits that you can avail if you progressively work for the entity. If he does not talk about any such thing rather keep on interrogating your skills and efficiencies, then this is a bad sign of the interview that you have just gone through. Whenever the interviewer is confirmed that you are perfectly fit for the job then he will try to build a friendly connection with you. He would like to make you feel comfortable. There are chances that some interviewer may even ask about your family background or family members, if the decision of hiring you is confirmed. But if the situation is totally reversed and even after completing the interview there is no sincere connection build between you and the interviewer then probably, you will get rejected. This is because for him, you are still a candidate who is absolutely unfit for his job opening. An interesting, uninterrupted conversation between the interviewer and you is clear indication that he is impressed by you. Just like any other person, even the interviewer would like to communicate with one who is notable to him and have all extraordinary qualities that he is looking for. The interviewer will communicate uninterruptedly and for long period of time, if you are precisely up to his expectations. In case your conversation with the interviewer is breaking frequently, then surely you have failed to impress him. He wants you to understand that impressing anyone through dialogue exchange is an art, which you still need to learn. Last but not the least, if the interviewer wants to hire you then he will like to know your availability, implying, when can you join the job and more such questions. If your interview is bad and does not want to hire then there is no need to discuss more such questions, as it would be waste of time for both of you. Interviews have always been a nerve wrecking experience be it for freshers or for experienced candidates.This feeling gets intense when your interview is not going as you expected or as you want it to be. The main reason for it would be attending the interview process without much preparation. Remember, it is not mandatory that you pass through every interview process you attend. But a little research and study before the process would increase your chances of getting hired faster. Never consider your rejection as failure. Sometimes, getting rejected in an interview process is also accepted as you will be able to learn from the mistakes which caused the rejection. Moreover, the lessons learned as part of your rejections will be very valuable and help you in the long run. According to the research by Glassdoor, it takes almost 26 to 30 days for a recruitment process to complete. The outcome of the interview is a prime thing which every job seeker will be eagerly awaiting for. As per the above stats, it is a long period and that phase will be a bit tough for every candidate who had attended the interview process. But there are few signs one could notice which can provide them with some clues of whether they would get a job or not. 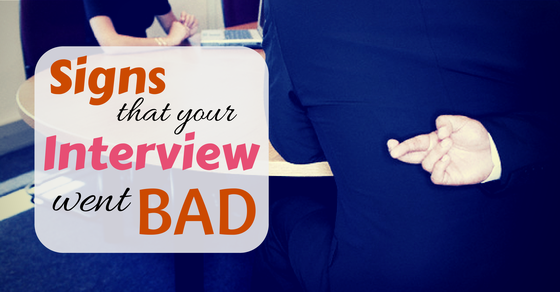 These are crucial signs that can help you judge that whether your interview was bad or not. Understanding these signs will not only help you to have a better judgment over your interview. These are crucial signs that can help you judge that whether your interview was bad or not. Understanding these signs will not only help you to have a better judgment over your interview session but might also help you to have a wonderful interview session the next time!